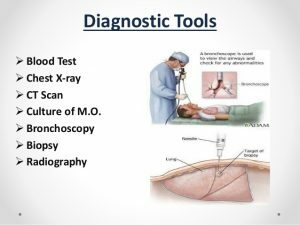 Deep Breeze Medical Diagnosis has developed a diagnostic imaging tool for respiratory diseases including asthma, pleural infusion and emphysema. The Vibration Response Imaging (VRI) system claims to be one of the first technologies to enable real-time visualisation of lungs throughout the breathing cycle. The system uses sensors placed on a patient’s back to record the breathing patterns. The sensors produce vibration energy in response to turbulence created from airflow travelling through the bronchial tree of the patient’s lung. The vibration response is then analysed with VPI’s software and converted into a dynamic image for the physician to examine the functional and structural properties of the lung in real-time. The technology comes from Deep Breeze Medical Diagnosis that is based in Israel and its product went on sale in the UK in September. Caretek Medical has developed an innovative needle-free drug delivery device that is the size of a fountain pen and uses a spring mechanism to deliver drugs through the skin in a solid dosage form. The patented ImplaJect device is said to accurately deliver drugs through the skin into the underlying tissue where the drugs dissolve and are released into the patient’s bloodstream. Dr Charles Potter, the founder of Caretek and inventor of the needle-free system, believes that for many drug applications the ImplaJect technology could replace needle and syringe injections, which cannot deliver solid form drugs, cause discomfort and carry an infection risk. Caretek Medical has already received ‘2.1m funding for its needle-free drug delivery device that was led by Oxford Technology 4 VCT plc and supported by Oxfordshire Investment Opportunity Network (OION). Recent articles by Connolly1, Hamilton2 and Sussex3, published in HES, have been somewhat pessimistic about the impact that Payment by results (PbR) will have on the NHS and the suppliers of products and services’ Bob Dredge. They imply that PbR will further destabilise the financial position of trusts, leading only to cost reduction measures which may compromise the development and provision of new technologies and treatments. There are logical arguments to suggest that this could happen. However there are equally strong arguments, and some international evidence, to suggest that it will not. Some clarification of the design and intent of PbR is therefore needed to counter the pessimism. First, why was PbR introduced? As Dr Colin Connolly (Connolly Research Consultants) notes, it is a system where money follows the patient. It started in a small way in 2003, first wave foundation trusts took it on in 2004, and the rest of the NHS began full transition in 2005. And it is intended that some 80%+ of NHS spend will be made under the system by 2008. It is a prospective payments system, following the model used in many other counties. It is not a new concept; although the scale and speed of the English roll out ‘ it is not being introduced in the same way in the rest of the UK ‘ is among the most ambitious. Both Connolly and Jon Sussex (Office of Health Economics) focus on PbR as a driver for greater efficiency in the NHS. And anyone who sees the productivity trends can understand why the Government would want to achieve this. But more than this, it is a process that will provide a fair and transparent way of funding local services. Transparent in that all providers will be paid the same price for the same product’s (with the caveat of an additional, differential payment to allow for unavoidable geographical cost differences’ the market forces factor). This price is set by the Department of Health (DoH), not negotiated locally, and is published for all to see. This means that the Government and the taxpayer are assured that inefficient providers are not protected by having their costs reimbursed, irrespective of relative efficiency. The system it replaces does exactly that. It allows for local negotiation of prices and means that a primary care trust (PCT) accepts the provider’s price. In terms of equity it means that no matter how elaborate the weighted capitation allocation formula to PCT’s is and there is much written and discussed on this not least by those PCTs with so-called under target allocations’ the fact that PCTs have been prepared to pay local providers 10, 15 or even 20% above the benchmark price for no service benefit has sparked little debate. In effect they have been depriving their populations of other services by supporting high cost hospitals. This is why it is fair. But it will only be fair if the price the DoH sets is itself a fair one. Currently the price is based, indeed generally matches, the Reference Cost for each service. These have been collected by the DoH for ten years, and are submitted by each provider on the basis of a fully absorbed costing exercise. This exercise is expected to follow a well defined national costing protocol, and the results are subject to external audit. So the DoH should be able to place a fair degree of reliance on them. Connolly argues: The current system is loaded with overheads and clinically non-specific. I would dispute this in detail, yet space only allows me to say that product’s that are costed, generally those within Health Care Resource Groups, are defined with significant input from clinicians. They follow established methodologies and reflect the outputs of a clinical service. They are currently being fundamentally re-designed, following revisions introduced for the early days of PbR. As for overheads, I am unaware of any enterprise that does not have them, and they need to be somehow absorbed. The most elegant and detailed costing methods will need to cover them. The point is the basis upon which they are allocated, and the way this then plays back through the price structure. Under PbR everyone will have the same price; the challenge is to manage costs such that the total cost of activities all activitie’s is recovered through the fixed price. This means that some services will make a positive contribution, some not. Overall the mix of services delivered must cover their costs. This is why, as Sussex and Louise Hamilton (Siemens Financial Services) point out, a focus on cost structures and opportunities to reduce total delivery costs is essential to survival under PbR. This is also where innovation and opportunities for moving and reducing costs outside of the conventional hospital setting will become important. The PCT will now save the full costs of patients not seen in hospitals, and there are processes in the PbR system that allow for the tariff to be shared with non hospital providers if the overall care pattern and pathway needs to be changed to deliver a better, more cost-effective service. So the NHS will be more interested in examining how technology can improve the overall cost of treatment, in a holistic way, rather than in simple cost paring at the margin. Delegates at a recent Welch Allyn seminar heard about the trauma suffered by patients who become aware during surgery. Chris Pomfrett reports on a technology designed to improve the monitoring of awareness. In around one in 500 procedures involving general anaesthesia, patients become aware during surgery. Experiencing the full pain of the procedure, they may also be unable to communicate what is happening to them. 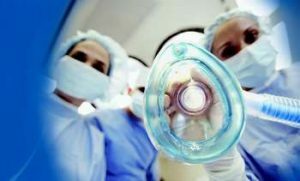 As a result, patients are likely to suffer post-traumatic stress disorder and hospitals may face litigation because of a failure to deliver adequate levels of effective anaesthesia to the patient. Knowing the correct depth of anaesthesia is a subjective skill developed by practitioners. But tools are now available to further assist the anaesthetist by providing an objective monitor of anaesthetic depth. Bispectral Index (BIS) is a proprietary monitoring technology developed by Aspect Medical Systems and licensed to other manufacturers. It has been in continuous development since 1987, attaining US Food and Drug Administration (FDA) clearance in 1996 and approval as an awareness monitor in 2003. A systematic review of BIS’s performance in many hundreds of scientific articles is currently being undertaken by the Cochrane Collaboration. The technology works by collecting high quality data from brain activity, performing advanced signal analysis on that data and presenting a summary of the brain’s activity on a scale of 0 to 100 in real time with a 15-second or 30-second smoothed trend display. The index of cerebral cortical activity is primarily obtained from frequency analysis of the electroencephalograph (EEG), separated from but using some additional information originating from the electromyogram (EMG), the electrical activity of muscles in the forehead under control of the brain stem. One analytical technique is bispectral analysis, which forms an important part of the bispectral index. BIS analysis compares the processed signals to a table of previous recordings from known states of anaesthesia related to the ability to respond to a verbal command. A BIS of around 100 indicates an awake, vigilant patient who will respond to a normal voice. BIS levels ranging from 90 to 70 indicate increasing levels of moderate sedation and an inattentive patient who will only respond to loud commands or mild prodding, shaking or painful stimuli. Below BIS 70 there is a low probability of explicit recall. BIS levels of 60 to 40 indicate a patient with a low probability of consciousness. BIS levels lower than 40 correspond to deep hypnotic anaesthesia, with burst suppression of the EEG seen with some anaesthetic agents. BIS 0 equates to no measurable EEG activity. Other approaches have used variables derived from the EEG to assess the depth of anaesthesia. Only BIS integrates different processed variables and compares them against a database of profiles obtained during prior anaesthesia. BIS has been compared with functional imaging techniques and has been shown to reflect the percentage reduction in brain metabolism during sedation and surgical planes of anaesthesia. In order to collect high quality EEG, special electrodes must be used with the system. The electrodes need to have consistently low impedances and be accurately matched to the monitoring technology. In addition, they should be easy to apply in a clinical environment, minimising the risk of cross-infection. Aspect Medical Systems has developed single-use sensor technology that reduces artefacts (XP) and is customised for operating room (Quatro), intensive care (Extend) and infant (Paediatric) applications. There is also the option of using a semi-reusable system (SRS) where only the sensor pads are changed with the electrical connection between the backing strip and cable good for 100 applications. The sensor connects to a digital signal converter (DSC) which means that an appropriately long connection may be used to connect the patient to the BIS monitor. BIS monitors are available stand-alone (XP), in modules provided by anaesthetic equipment manufactures, or as an electronic board for developers (BIS engine). A further development is BISx the BIS technology is held in a box kept near to the patient’s head which connects to a BIS aware anaesthetic monitoring system which changes its display to show BIS when connected via the BISx socket. Another EEG-based consciousness monitor that is available is the Entropy from Datex. It also uses Aspect’s Sensor technology connected to a monitoring system with a different type of EEG and EMG analysis. Entropy also presents a 0 to 100 scale and may well prove to be another useful tool. But it is not only in monitoring light awareness that these tools may be needed. It has also been suggested that excessively high levels of anaesthesia can potentially lead to adverse clinical outcomes. If such deep anaesthesia is proven to be a problem, maintenance of appropriate anaesthetic depth with an objective monitor like BIS will become even more important. The question now is not if, but when, some form of depth of anaesthesia monitoring will become part of a new standard of care. Progress towards a smarter NHS depends on the engagement of clinicians and, increasingly, the patients themselves’ Debjani Duncan. Clinical engagement is not a new concept for procurement but the ways in which it is achieved and the agenda it sets out to address now needs to change. The current drive within the NHS is firmly concentrated on delivering responsive, convenient and personalised services for all patients regardless of demographics and diagnosis. This has created a shift in emphasis on the clinicians’ agenda which is far more all-encompassing than the business of delivering high quality healthcare. Increasingly the mandate handed down within the NHS Improvement Plan1 requires a multi-faceted and inclusive approach to reform which covers organisational and sector boundaries. These new challenges are set to create dramatic impacts as the patient journey reduces to 18 weeks by 2008 and the ten high impact changes2 proposed by the Modernisation Agency are addressed. That’s not to mention the implementation of national service frameworks and other clinical governance or safety initiatives. Within this landscape therefore procurement personnel, whether clinical, NHS-experienced or otherwise, will have to develop a real understanding of where they fit on the clinicians’ radar and utilise that understanding to maximum effect. I believe that this is the only way that embedded change will take place and commitment and cooperation at all levels will be essential. Thankfully it is little disputed that to achieve this will require far more engagement of the principal stakeholders’ namely clinicians and, increasingly, patients themselves. In addition, outside of the day job the six main challenges set out by government for clinicians to address partnership, professions and workforce, performance, patient empowerment, access and prevention are the priorities that they are working to. Industry and procurement have to mirror this by tailoring their efforts and services accordingly, otherwise true engagement will not happen. The old what’s in it for me adage still rings true if you cannot help address clinicians’ most pressing needs, there will be no incentive for them to cooperate and embrace the behaviours we desire from them. The only way to achieve this is to find ways of directly relating procurement activity to the delivery of these challenges and demonstrate tangible ways in which we can contribute. We must therefore be aware of these changes to keep abreast of clinical needs and to help those who facilitate the purchasing of clinical products to achieve the collective goals of a smarter NHS. As we know, there is still a healthy scepticism among clinicians about the procurement process. However, by recognising the skills and knowledge they possess, and tapping into what fires them up, efforts at getting innovative products to market, ensuring sustainability over time and building relationships with product users to modernise and improve healthcare, will be greatly enhanced. The demographic shift towards an ageing population means that the overall market for healthcare will continue to grow. 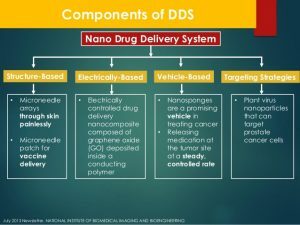 In addition, the population is becoming more demanding due to increasing awareness of the possibilities that might be achieved through the use of new technologies, materials, systems and processes in the delivery of healthcare. The main drivers for the NHS in the future will be the increasing trend towards community-based solutions to healthcare. This shifting emphasis represents a major challenge for those delivering the service and an opportunity for the design of new products and services tailored to the more local and personalised environments in which they will be used. Consideration of design will become more critical, as the types of medical devices and services used in hospitals tend to become more stigmatising when used in the home. With these changing patterns of care there is a clear need for the NHS to foster and adopt new solutions to healthcare problems. What is not always so clear is how the service can specify and procure in a timely and transparent manner what it needs. For businesses, this situation presents multiple barriers through lack of understanding of the process of clinical procurement. The increasing trend to employ strategically placed clinical staff within collaborative procurement hubs and confederations is set to address some of the main issues, by working in partnership with local staff within trusts to address the lack of resource to undertake clinical trials’ and/or access to patients for the trials, as well as the multiple approval processes to get into each trust’s supply chain. Fundamentally though, there are now increasingly clear pathways developing for business and clinicians to share knowledge and intelligence on what the NHS is trying to procure and how that might be supplied through the conduit of clinically-trained procurement personnel. Collaboration’s working across trust boundaries, multiple agency initiatives, private sector partnership and patient involvement in procurement decision’s signals the way forward for public procurement in the health sector as a joined up, networked activity Christine Harland. This year’s Health Care Supplies Association conference (London, 3-4 November) featured high level speakers, not just from the procurement community, but also from the broader NHS and public procurement arena. Despite the diverse range of topics some common themes emerged most strikingly that of collaboration and joined-up activity. As Christine Beasley, Chief Nursing Officer, highlighted, this new way of working involves discussion and facilitation, rather than individual authoritative decision making. She referred to patients as senior partner’s not passive recipients. Duncan Eaton, chief executive of the NHS Purchasing and Supply Agency (PASA) urged the procurement community to fully involve patients in decisions on how NHS money is spent to provide their care. One speaker (not from the NHS, I hasten to add) painted a picture of patients as simple folk who, if given a choice of provider, will base their decisions on food and car parking. In my experience this is absolutely not the case. Carers and patient’s particularly those with long term and serious health problem’s can become highly educated about their condition and possible treatments. In the last few weeks we have seen patients use media coverage of the prescription of Herceptin by other primary care trusts (PCTs) to reverse decisions made about their own treatment. In our research on collaborative supply networks in healthcare, patient involvement in prosthetics and wheelchair design has had a profound impact on procurement decisions that improve quality of life. Attempts to include patients in decision-making must be genuine and afford them respect. However, this strategic, holistic approach to procurement necessitates highly qualified, thinking practitioner’s and it is generally accepted that these are not in plentiful supply. Joe Gibson, chief executive of the Lifesource collaborative procurement hub, offered a sensible short-term solution’s surround your best procurement people with resources which allow them to focus on their core competence. John Oughton, chief executive of the Office of Government Commerce (OGC), described how the OGC draws in procurement people from outside the public sector, in addition to growing its own through investment in undergraduate placements. I empathise with both views. In my research centre at the University of Bath I surround research staff with administrative and technological support. Researchers research 100% of their time instead of doing tasks that others can do better and more cost-efficiently. I am frequently required to defend this approach against proponents of so-called lean organisation’s; I argue that it is lean. I also like the grow your own approach. Public procurement, particularly in the complex confederal NHS with its many, sometimes conflicting, issues takes a long time for people to get their heads around. Collecting evidence and measuring outcomes is imperative for procurement. If the only measures we have are savings-based, this is what will drive us. We need to implement measures that provide evidence of other benefits of public procurement such as social, economic and environmental benefits, now termed sustainable procurement. And it is around this last point that the main dichotomy of this conference appeared. I had a sense of left hand and right hand that troubled me and it came down to the policy and ethos of a public sector health service. One speaker promoted increased commercialisation of services; while a practical reality, patients are none too happy at being refused a MRI scan because the scanners are booked for private use for six months. In my own presentation I emphasised that if the NHS is to afford the increasing costs of drugs and technologies required to deliver leading edge healthcare, plurality of provision and partnerships with the private sector are essential. However, I expressed concern about unintended consequences of decisions that impact acutely on supply markets. There is particular concern over the limited involvement of procurement professionals in sourcing decisions for large areas of spend such as treatment centres, outsourced services and new hospitals. Duncan Eaton expressed the view that if the outsourcing of NHS Logistics went ahead the NHS must retain strategic responsibility for clinical equipment. Not to do so would be madness. And I agree wholeheartedly babies and bathwater spring to mind. Dimitrios Hatzis of the Commercial Directorate of the Department of Health said that anything can be outsourced if it’s specified and managed professionally and to a certain extent I agree with this as well. But managing the ethos of a unique public sector healthcare service being performed by a private sector, possibly culturally different, organisation requires sensitive service level agreements. There is plenty of evidence of unintended consequences when we have failed to recognise broader forms of value in service level agreements. Hospital cleaners used to chat with them, help them eat their lunch and offer a cheery face; outsourced cleaning contractors must adhere to the most efficient rota of tasks to be performed. Private sector catering providers increased patient satisfaction and reduced costs but in some cases provided inappropriate nutrition, leading to increased clinical malnutrition. So, I sincerely hope that the DH can pull this off successfully, becoming a beacon for other government departments to follow. Let’s hope next year’s conference has shining examples of these successes. The aim of this report is to identify the memory management methods used by carers, professionals and memory aid users, and report their comments on their positive and negative features. Devices marked as memory aids and products in development are also listed with their features and functions. The information was compiled in tables to enable users and providers of memory aids to develop a system to meet the needs and abilities of users. The report includes information on cueing devices; note-based memory aids; strategies used to aid memory; telephone and electronic devices; medication management; reviews of products marketed at the time of the study, including pill dispenser’s, blisterpacks, NeuroPage and Memo Minder (voice reminder alarm); and products in development (packaging design for tablets, Memojog, Neurotxt, an object locator, a bath monitor and a cooker monitor). 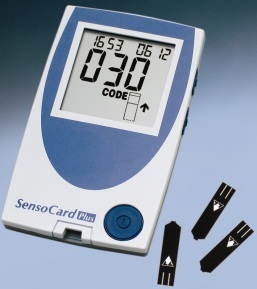 This is an evaluation of the CDx SensoCard Plus blood glucose meter with the SensoCard test strip which is intended for home use for diabetics. The system, which uses non-wipe biosensor technology to measure glucose in capillary blood, has the ability to provide instructions and test results via synthesised speech for visually-impaired people with diabetes. The system requires 0.5 l of blood, has a measurement time of five seconds, is simple to operate and requires minimal maintenance. In the clinical study when results were compared with those obtained using the hexokinase method, there was a significant variation in bias between the results from the two batches of test strips. However, there was no significant meter-to-meter variation in bias. Error grid analysis against the hexokinase-adjusted results would classify the system as clinically acceptable for both meters tested, with all of the results falling into Zone A. The system also met the criterion for acceptable imprecision and acceptable total error. 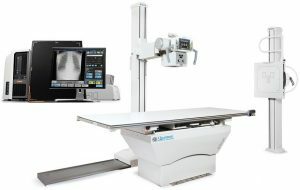 Direct digital radiography (DDR) systems are replacing film/screen radiography for general radiographic examinations in many hospitals and its use is likely to rapidly increase with the national programme for the installation of picture and archiving systems (PACS) across the NHS, scheduled for completion in 2007. This report summarises evaluation data on a range of digital detectors: Canon CXDI-31, Delft ThoraScan, GE Revolution, Hologic DirectRay, SwissRay dOd HP and Trixell Pixium 4600. The pre-sampled modulation transfer function (MTF) shows the faithfulness of the transmission of the incoming signal of the detector. The Hologic has a much better MTF than the others while the Delft is poorer in the scan direction of the scan array and there is a slight difference between directions for the SwissRay which uses lens and mirror coupling. The Hologic detector also has a very different normalised noise power spectra (NNPS) frm the others, with good transmission of high frequency information but also of high frequency noise. But all of the detectors are satisfactory for measurements of detective quantum efficiency (DQE). The GE Revolution an dthe Trixell Pixium 4600 have the highest peak of DQE of the six detectors. The Hologic DirectRay shows variability of DQE with dose, which indicates significant structural noise in the image. maging system in order to improve the visualisation of patient data for doctors, surgeons, pathologists and research scientists. The Imaris 3D system incorporates features that allow time-based visualisation of images, the creation of 3D or multi-channel images, or the production of animation movies. One feature, for instance, can be used to monitor temporal changes in biological systems. 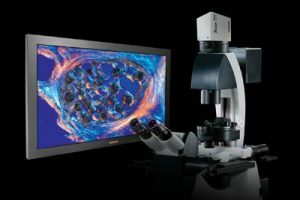 The system also seeks out filaments such as neurons, microtubules or blood vessels and retains and calculates topological information for the user. The Imaris system can also be used in conjunction with a stereomicroscopes or endoscopes either to get a real-time and deeper view of patient tissue or as a training tool for future surgeons.